Much like current Duke player, Marvin Bagley, Barrett reclassified from his original 2019 class and still remained the top rated player. Barrett led his Canadian National team to a Gold Medal over Team USA this summer and is a can't miss prospect. His decision is slated to happen in his home country of Canada with friends and family. Barrett will be able to sign a letter of intent for his decision date falls within the November national signing period which goes from the 8th until the 15th. Barrett can score in multiple ways on the court and is a versatile athlete. He is a game changer for whichever team lands his services. Duke most recently had an in home official visit with Barrett. Most consider the Blue Devils a favorite to land the outstanding talent with Kentucky just behind. Oregon is also recruiting the 6-7 Barrett. Barrett visited Duke for his official visit last month and reports say that visit went well. There is always a possibility he could move the date of his decision but it will likely come on a signing day show if it remains as is. If the Blue Devils were to gain his services, he would join point guard Tre Jones and WF Cameron Reddish to make up a dynamic trio in Durham. Duke is also considering other top rated players in the class and will entertain a bevy of prospect for the upcoming Countdown to Craziness. Mike Krzyzewski and his staff have been getting their share of top rated stars by getting them to the NBA in short order. Duke had three first round draft picks a season ago and will have more this season where mass defections are expected. For more on Barrett, check out Blue Devil Nation Premium where we discuss recruiting in more detail. The nation's top prospect in the class of 2018 will venture to Duke this weekend for his official visit. R.J. Barrett is the real deal! The young man is making a name for himself and his nation of Canada proud along the way. 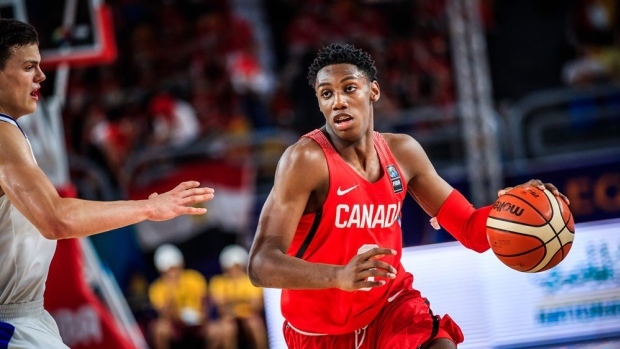 R.J. Barrett led his Canadian National Team to a win over Team USA and in the process earned a gold medal this summer. He is a can't miss NBA talent who plays his high school basketball for Montverde Academy in Florida. The big time prospect will be seeing the Duke campus and facilities for the first time this weekend. During his visit, he will likely get to see this years team as well and perhaps play some pick up with them. The Blue Devils have zeroed in on Barrett as have other schools. He has already visited Kentucky and will take three other schools in Arizona, Michigan and Oregon after his time in Durham. There will be plenty of playing time a year from now for the Blue Devils in that a mass exodus of players are expected to declare for the NBA Draft. Duke could conceivably lose their entire starting line up and more after this coming season. But the Blue Devils reload quickly these days. They've already gained the services of point guard Tre Jones and the multi talented Cameron Reddish. And it is no secret that those guys are trying to get others to play beside them for another run at a title. Barrett is all the rage in that he is the latest Canadian star to gain big time hype. In fact, most feel he will be the best player from the country which is producing more and more top-tier players yet. If you are wondering about how this young man would fit into the Duke system, let us count the ways. Barrett knocked down 38 points in his Canadian National Teams win over a loaded Team USA. He was playing against a talented and older team when he did so. Quite simply, R.J. Barrett is a scoring machine. He blows by defenders or can go over them for his perimeter shot. Barrett also finishes well on the offensive end which is a tribute to his athletic ability. His length should allow him to be a solid defender at the next two levels of play. He is capable of guarding multiple positions already and moves well on the court when off ball. 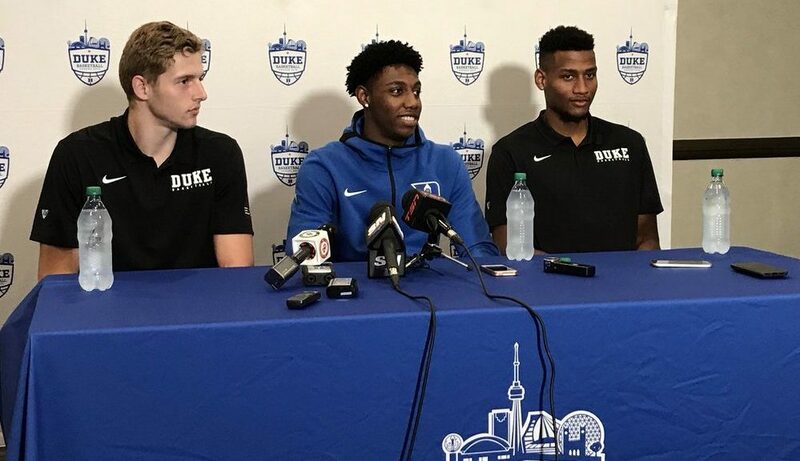 The addition of R.J. Barrett would give Duke one of the most versatile teams in the nation. He would also benefit from playing with a stellar point guard on Tre Jones, who is a proven winner and unselfish as was his brother who won a national title at Duke. It will likely come down to a Fall decision for Barrett and his family who are methodically analyzing their options. We will likely know by November or possibly sooner, where this talented young man will play his collegiate career. 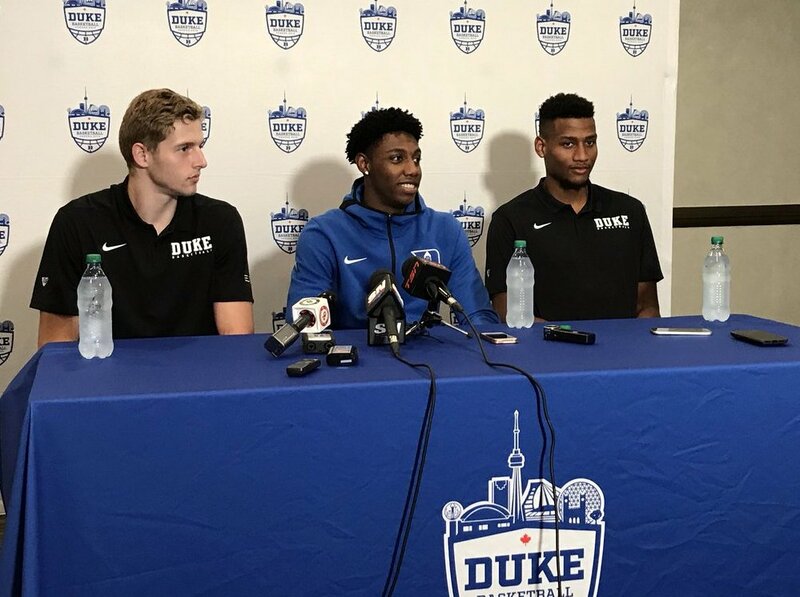 Duke has been on a roll in recruiting where they individually structure plans for players to get to the pro game or expand their education. The Blue Devils put another four players into the NBA this past season and next year there could be more than that. With that kind of pedigree and to play for a coach who led the USA men's national team to three gold medals, it is a small wonder that Duke is having great success. Barrett would be a nice fit for the program and Blue Devil fans would certainly enjoy seeing him bring fans to their feet in Cameron.